I had this beer at a bottle share several months back and remember being enamored with it. I recall it being one of the highlights of the day and couldn't wait to get my hands on more. It's a milk stout made with "natural flavors", which is code for completely artificial, but hey, if it tastes great, then who cares? Pours pitch black with just a tinge of dark brown on the edges when held up to the light. I got a finger of light brown head, but is disappeared quickly. The best way to describe the smell is peanut butter Twix candy bars and probably I'd say peanut shells more than actual peanut butter. Maybe a little bit of lactose, but the peanut butter flavoring is winning out big time. Disappointingly, the peanut butter is heavily subdued on the taste. It actually taste more like a straight up milk stout without any flavoring, but it is still there. What little peanut butter is here tastes completely artificial. I know this is not made with real peanut butter, but whatever flavoring they used doesn't even attempt to pull itself off as legitimate. I can barely pick up lactose and even a slight graham cracker flavor too. It has an odd, dark fruit or even black licorice taste on the finish that I'm not happy with (possibly infected bottle?). This feels perfectly-bodied for the style, but still not all that mouth-coating. The unpleasant flavors from the finish really do linger as does the sticky mouthfeel. It has a bit more carbonation than I'm used to and if you're not careful, it can fill your belly up in a hurry. I was hoping for a sweet dessert beer with this PB Milk Stout, but the flavors were off and thin with tons of carbonation and less than favorable lingering flavors. 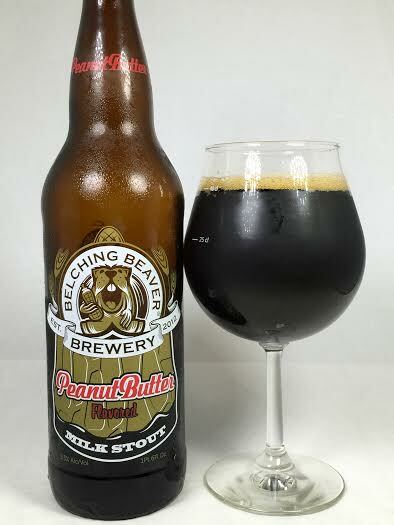 I think peanut butter in porters and stouts is a great idea, but in this case, it did not turn out that well. A lot better on tap.